Edwin Young was the eldest son of Edward and Frances Elizabeth Young of “Ivy Cottage” 11 Station Road, Ash Vale (number 20 in 2010). 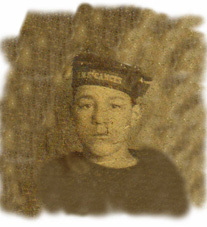 Edward Young was a cab proprietor, and they had nine children, three boys and six girls. The Ash Parish Magazine April 1906 records that Sidney Blake, Sydney Nash, Albert and Oliver Williams and Edward Young were amongst 35 boys who received prizes for good attendance at St Mary’s Sunday School. Edwin Young was one of the 35 old boys and evening class students from Ash Vale School who had enlisted and whose names were on the School Roll of Honour in 1915. The Aldershot News 24 September 1915 reported the tragic death of Mrs and Mrs Young’s eldest son. A month previously he had gone to Portsmouth for torpedo training. 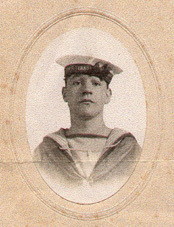 On Friday 10 September he was setting a torpedo when the instrument exploded and he was blown to pieces. Only an arm and a leg were found that day. The main portion of his body was found a week later. The news of his terrible end had cast a gloom over everyone. The Aldershot News 1 October 1915 reported that Edwin’s funeral had taken place at Portsmouth with Full Naval Honours. Some of his mates were allowed to attend.